I was in a fancy house in Scandinavia. Someone I knew was putting on a wedding. I didn’t know the people just the person organizing it. It was this huge tall tower of a ‘staircase’ that was like a never-ending snow cliff / trail / slide / staircase. It was sumptuous white, super soft carpet – whiter than snow and super narrow with no railing on the steep side – just a pure edge and drop-off down hundreds of feet. I sat down at table and across from me was this HUGE window out to the seas and I was so amazed that it was the ocean right there. It was dark outside and Scandinavian. Then all of a sudden a HUGE whale jumped out of the water right in front of the window and made a HUGE splash, drenching the windows. And the people were very proper-like and seemed that they didn’t see it / didn’t want to talk abut it. And I felt so bewildered by their ambivalence and a little bit like was I crazy? And then I felt like it was like a thestral, like only I could see it. And it went walking on 4 legs head down back into the sea. But then! Again! Its HUGE head, right up close to the window and I could see all of the lines along the underside of chin and I was amazed and in awe, but didn’t shout out like I had before. What is this dream about? Scandinavia: This is clearly a dream about my ancestry. Wedding: A union of two complementary energies: of feminine and masculine, of material and spiritual, of conscious and unconscious, underworld and topside world. Descent via a white path: In WWRWW, been reading a story about the descent of a woman to the underworld, about the descent to the wild garden of subconscious. This seems to make sense as the water and the whale feel like representatives of the subconscious. A descent into another kind of knowing. Also could mean a going back in time. A going back to our original home – the sea, back to our ancient ancestry. Fancy people: Plotkin says that each element represents some aspect of ourselves. The fancy people are the mundane, the regular, the conscious / topside world that seems unaware, ignorant or even willfully dismissive of anything awe-inspiring, magical and relating to the non-human world. There is always some part of myself that absorbs that consciousness that rules our culture that can shut down my enthusiasm and shout of joy, abundant self-expression of awe and wonder. How it was the presence of these people who kept me from “shouting out like I had before.” I kept my wonder internal, which made me feel alone and bewildered, and also self-doubting. Humpback Whale: So this is the key image of this dream, the Key symbol. And what a symbol! I looked up whale in my Animal Medicine book. For me personally, whales do make me think of my own youth – and the 1970s. My whale mug, my whale necklace, artifacts of my dad and my mom. Whale carries the history of Mother Earth. Whale saw the events that led to the settling of Turtle Island (North America) and has kept the records and knowledge of the Motherland alive. It is said that Mu will rise again when the fire comes from the sky and lands in another ocean of Mother Earth. Many Whale medicine people are able to tap into the universal mind of Great Spirit, and have no idea how or why they know what they know. Only later, when they receive confirmation, do they begin to understand how they know or why they received the impressions. 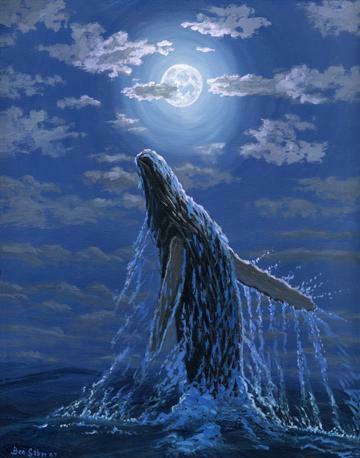 To recall why the shaman’s drum brings healing and peace is to align with Whale’s message. The drum is the universal heartbeat and aligns all beings heart to heart. If you pulled the Whale card, you are being asked to tap into these records and to allow yourself to be sung to be those who have the original language. Whale signals a time of finding your origins, of seeing your overall destiny as coded in your DNA, and of finding the sounds that will release those records. After all you are the melody of the Universe, and the harmony is the song of the other creatures. In using your voice to open your memory, you are expressing your uniqueness and your personal sound. As you open to this uniqueness, the animals that are your nine totems may then send their sounds of calls to you or through you. This will open your personal records so that you may further explore your soul’s history and commune with Whale, who carries the history of us all. Humpback Whale Song: They are famous for their songs. Researchers have noted that at any given moment all males in a group will sing the same version of a song, even when separated over large distances, while whales in another region or hemisphere will sing a completely different song, but in unison with other whales in their area. …They can be heard many miles away and may go on for hours or even days. It was thought that female humpbacks did not sing, but now they are noting they do, only in deeper lower frequencies. Wikipedia says that humpback whales are mostly solitary. The message: You have the ability to hear and understand the ancient language, and know the story of the Motherland. If you can hear it, you can help bring it forth. Sing your song. Others won’t recognize it. But it is no less real. I feel excited and overwhelmed and curious and just at the beginning. I resonate completely with the knowledge that is is a resonance, a song that carries the wisdom of our ancient heritage – that will align us all into an energetic convergence wherein we as individuals link together in unison to make us all whole and one. One thing in Wizard of Earthsea that has been striking to me as Truth is that there are the “true names” of all beings and in listening and reverence one can come to know them – of creatures and ultimately of oneself – your true self. Which also resonates with Plotkin’s talking about how one can be given one’s ‘true name’ by the All when in quest of it. I think the humpback whales are singing the song of the Motherland – they are singing the story of our creation – the ancestry not only of all living beings but of the waters and of the earth. Not just my ancestry but that of us all. Listen – listen to whale songs with an ear to attuning my whole being in interpretation of them, listen to other sounds of nature, this issue on sound from the NYT. Meditate. Journey. Listen to that which is “broadcast from deep inside” as CPE says. Do the sound healing and a whale transmission? Learn more about my Ancestry and Norse pagan mythology – Pedersen (son of Peder, rock, relation? ), Andresen (son of Andres), Wycliffe (from White Cliffs), Rhoads.